Visiting Nantucket for the summer, three women seek peace and comfort as they cope with the challenges in their lives--from marriage, infidelity, and the mayhem of motherhood to scandal, tragedy, and illness. Three women--burdened with small children, unwieldy straw hats, and some obvious emotional issues--tumble onto the Nantucket airport tarmac one hot June day. Vicki is trying to sort through the news that she has a serious illness. Her sister, Brenda, has just left her job after being caught in an affair with a student. And their friend Melanie, after seven failed in vitro attempts, is pregnant at last--but only after learning that her husband is having an affair. They have come to escape, enjoy the sun, and relax in Nantucket's calming air. But into the house, into their world, steps twenty-two-year-old Josh Flynn. 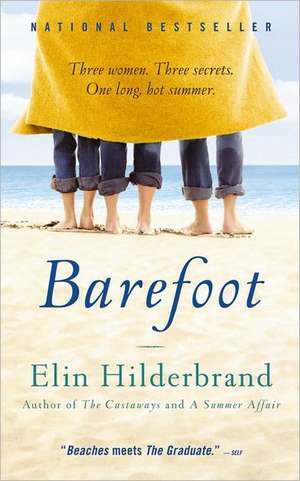 Barefoot weaves these four lives together in a story with enthralling sweep and scope--a novel that is as fun and memorable and bittersweet as that one perfect day of summer.